Have you ever worried that you would not be able to feed your family? In the remote regions of Africa where the BOMA Project works, women like Sarah Lenalparsipia, above, experience that fear every day. With your help, we are changing that fear into strength, and hunger into hope. Your support for BOMA means that thousands of women like Sarah have access to resources and training they need to lift their families out of extreme poverty. 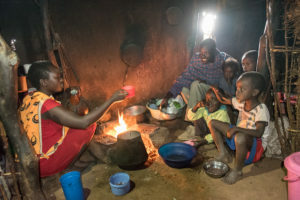 Your support enables women like Sarah to break the crushing cycle of intergenerational poverty, hunger and reliance on food aid. They get on a path to self-reliance, so they can earn an income, feed their families, send their children to school and save money for emergencies. Your support means that they no longer worry about where their family’s next meal is coming from and can plan for a brighter future for their children. Your support means everything. As we gather with our families this Thanksgiving holiday, there is much to be grateful for. In the past nine years, we have helped more than 118,000 women and children overcome extreme poverty. We are now aiming to reach one million women and children by 2022. To meet that goal, we urgently need your help. From the thousands of women whose lives you are changing, and all of us at BOMA…thank you.